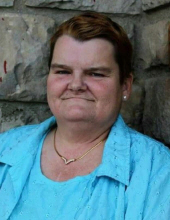 Charlotte Phyllis Rice, 49, of Napoleon, passed away at 6:19 p.m. on Saturday March 16, 2019 at the Henry County Hospital. She was born on March 10, 1970 in Defiance to Odgar Eugene and Phyllis Ann (Thomas) Rice. Surviving is her father, Odgar Eugene Rice; daughter, Lorie Ann Wolfe, Defiance; brother, Gregory Eugene (Lori) Rice, West Virginia; three sisters, Shirley Jean (Dennis) Hoover, McClure, Cheryl (Donald) Ludemann, Napoleon and Cherry Gibson, Napoleon; Uncles, Samuel Rice and Gerald Hanson, Aunts, Virginia Hanson, Kathleen Rice and Gloria Caler; numerous nieces, nephews, cousins and great-nephews, Dustin Gibson, Bentlee Gibson, Kingston Rettig and Jadyn Rettig. She was preceded in death by her mother Phyllis Ann Rice, Uncles, Thomas Rice, Ronnie Caler and George Thomas, a cousin Jeffery Caler, great-nephew Dusty Eugene Ludemann and her grandparents and great grandparents. Charlotte was a 1989 Napoleon High School graduate, Liberty Center Volunteer Fire Fighter/EMT and a member of the Napoleon Church of the Nazarene. She was involved with the special Olympics and enjoyed swimming, bowling and playing basketball and softball. Charlotte also loved watching football, especially the Ohio State Buckeyes and Pittsburgh Steelers. She will be remembered as always having a big smile, a big heart and a sense of humor. Charlotte would do anything for anybody and will be greatly missed by her family. Visitation will take place on Wednesday March 20, 2019 from 2-4 & 6-9 p.m. at Walker-Hoening Mortuary 333 W. Main Street, Napoleon. Funeral Service will take place at 11 a.m. on Thursday at the mortuary with Pastor Chip Bullock presiding. Burial will follow at Forest Hill Cemetery. Memorials are suggested to the American Heart Association. To send flowers or a remembrance gift to the family of Charlotte Phyllis Rice, please visit our Tribute Store. "Email Address" would like to share the life celebration of Charlotte Phyllis Rice. Click on the "link" to go to share a favorite memory or leave a condolence message for the family.